The total road width on Victoria Bridge is 9 metres. Presently each car lane is about 3.3m wide and the shoulder lanes of 1.2m maximum (reducing to not much). We could have 2.5m car lanes with 2.01m bike lanes – ‘New Zealand legislation states’ that a “lane for the use of vehicular traffic … is at least 2.5 m wide” This would be safe for people biking, but is it reasonable and practical? 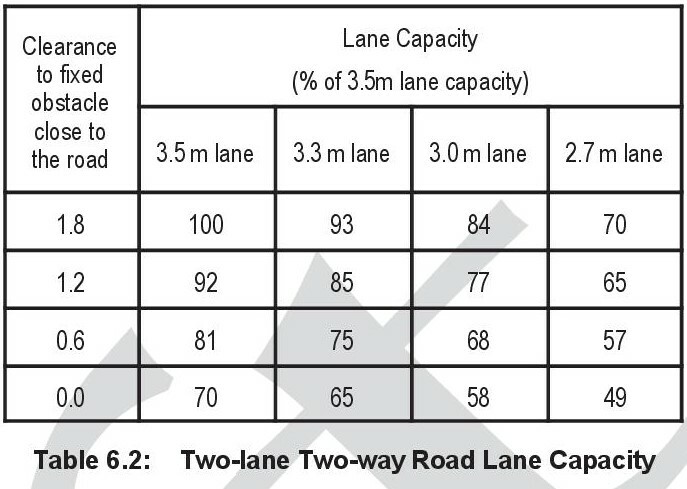 The table below starts with the ‘ideal’ vehicle lane width as 3.5m with 1.8m clearance, if the theoretical capacity is between 30,000 to 34,000 vpd. With the car lane capacity at 85% of the ‘ideal’ for Victoria Bridge – 3.3m with 1.2m shoulder – the vpd total equates to 25,000 and 29,000; which is what the above graph shows. If lane widths were changed to 77% of the ‘ideal’ – 3.0m car and 1.5m bike lanes – the count could be expected to equal about 23,000 to 26,000 vpd. The 26,000 vpd is just above what the Victoria Bridge has been carrying for the past six years (from 2012). Would this be reasonable or practical? In theory the Victoria Bridge could be improved by changing lane widths The problem we have is that the car and bike lane widths would be at recommended minimums, and humans make mistakes, Presently at 50 km/h the person using the narrower cycle lanes has a 50/50 chance of not being killed in a crash, a 1.5m bike lane is the tipping point between safe and unsafe. So a safer speed limit would also be needed to be added to the improvements, which would have the added benefit of giving traffic a more even flow. Summing up: would it feel safer, will more people bike instead of drive, would more people be using Victoria Bridge if single occupant car drivers did not dominate the road space, is this solution reasonable and practical? Currently, cycle lanes in Hamilton are a joke. Cycling across Victoria Bridge is an invitation to get hurt and there’s not going to be an easy way of making it safer without cost. It’s not like the Millennium Bridge appears to be happening anytime soon, and at this rate we might hit the new millennium before a safer cycling strategy is implemented. I gave up cycling in order to walk – it’s a lot less stressful, and certainly safer. How about a one-way system, with two way for bicycles? I think there would be more bikes on the road if we could actually make it less hazardous for them. I cross this bridge several times a week – on a bike. If the speed limit were 30, it would be brilliant. Going home around 4:30-5:00 bikes are often faster than cars, which are stuck in a jam. But, cycling faster than car traffic can be dicey because drivers often encroach on the bike lanes. Raising them 30-50mm above the car lanes, as is common in the Netherlands, would make them much safer to use. Thank you, Peter, for your continuing commentary on Hamilton road design. One place a pedestrian/bike/scooter bridge could go is at the end of Riro Street crossing over to the new Victoria on the River park. Once you come out of Memorial park it would be logical to cross over to the city. and people on Memorial drive could head over at that point rather than going up the steep hill to Claudelands Bridge. Unfortunately, I doubt the council would ever agree to spend money on that. They’re too obsessed with big expensive infrastructure for new greenfields growth at Peacockes. Definitely need to reduce speeds on both Victoria and Claudelands bridges. They are our most urban bridges, and this should be reflected with narrower vehicle lanes and wider bike lanes and footpaths. The bridges are pinch points and that means everyone should be slowing down. I used to frequently cycle across Victoria bridge and vehicles would often just ignore the ‘cycle lane’ and it was really dangerous. The cycle infrastructure in this area is a joke. Biking between the univeristy and the city via Clyde Street and over Victoria Bridge should be safe and easy but it was anything but. You’re misinterpreting the table showing vehicular capacity. For a start, it is based on rural roads with higher limits. You’re also underestimating the clearance to a roadside object, which would be the kerb. With a 1.5m cycle lane, you have 1.5m of clearance. Of course, it should be obvious that the best design for that bridge is a 1.8m wide cycle lane, a 30km/h limit, and no marked centerline. The Table 6.2 is probably as reliable as a political poll with a wide margin of error. It tells me lane width effects human behaviour; it is there to help get a feel for reaction. At 26,000 vpd changing Victoria Bridge lane widths from 3.3 to 2.5 would you get motorist actively protesting? If we changed from 3.3 to 3.0 how unhappy would car drivers be? To be honest, I don’t think motorists would actually notice going to a single shared lane at 5.4m (~2.7m each direction) the traffic is so bad through there at peaks that no one expects to travel at speed, and off peak you are expecting to stop at the lights at either end. I don’t think that narrowing the lanes slightly would actually change capacity here either. The capacity is constrained by adjacent junctions, not lane width.